Hasil daripada carian maklumat tentang Jepun selama beberapa hari dan malam ~ di sini saya kongsinya dengan anda pembaca budiman. Harap2 dapat membantu. Can’t decide when to go? Check this out! Perkhidmatan ini membantu anda untuk menghantar bagasi anda ke alamat yang dituju (same day or the day after). Ini memudahkan pergerakan anda terutama jika membawa bag yang besar2 yang amat sukar untuk turun naik tangga di station. For a very reasonable price, you can deliver your luggage to your next accommodation on the following day (depending on the distance from place to place). For example, a bag from Tokyo can be delivered the next day to Kyoto for only 1,900 yen and 2,200 yen for Kyushu. Apply by phone or via internet. Bring your luggage to a “convenience store”(konbini). Takkyubin (indicated by a sticker depicting two black cats) offers delivery services from these stores. Bring your luggage to the counter of Kuroneko Yamato (a delivery company that provides Takkyubin services) in your neighborhood. If you do not know where to find it, watch for a delivery man in a green and yellow uniform wearing a cap and ask him. Kuroneko Yamato remains the country’s largest delivery service, but there are others like Sagawa Express or Nittsu. If you are staying in a hotel, employees will of course take care of all these steps for you. You can get them at the nearest konbini. Ask for a takkyubin no denpyo preferably “motobarai” (payable at time of shipment). Airports, train stations and even large department stores offer locker services costing between 500 and 1000 yen. You will also find that there are usually many lockers and different sizes as well. For somewhere between 300 yen and 1,000 yen you can store your bags for one day (until midnight). One last thing: if you leave your luggage somewhere, like traveling on a train for example, do not despair. Objects are rarely stolen and recovering lost property is not uncommon. Do not hesitate to contact the place where you might have left you baggage. If you get out Central Exit, make a right and walk toward Granvia Hotel (there’s a signpost over your head). Then take a right here also and head along on the corridor 80meters or so. You’ll find a 2storied grayish ferroconcrete buiding across from the driveway on your left. Take the escalator to the second floor; the checkroom is located just around the corner on the right-hand side. Male uniformed staff will take care of you. I may possibly be wrong, but as I recollect, they charge you 400 or 500yens per suitcase per day. Shinkansen, the famous bullet train provides comfort and speed, for a very attractive price if you have the Japan Rail Pass . The Shinkansenallows – among others – the Kyoto-Tokyo routes, Tokyo-Hiroshima route and since March 2015 Tokyo to Kanazawa. A must! Look up these airlines (earlier) to get cheap fares ~ Peach Aviation, JetStar and Air Asia Japan Skymark (1996) offer cheap flights to the main destinations in Japan. 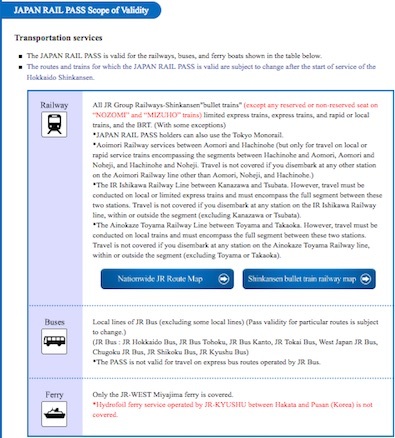 This site in English has information on train and plane times in Japan. If you have internet access in Japan, this is a powerful tool to help you plan all your journeys while in the country. 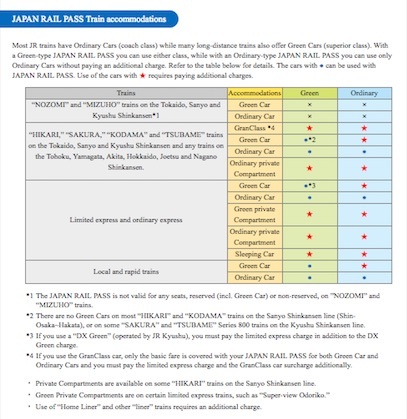 The official Japan Railways information site translated into English. 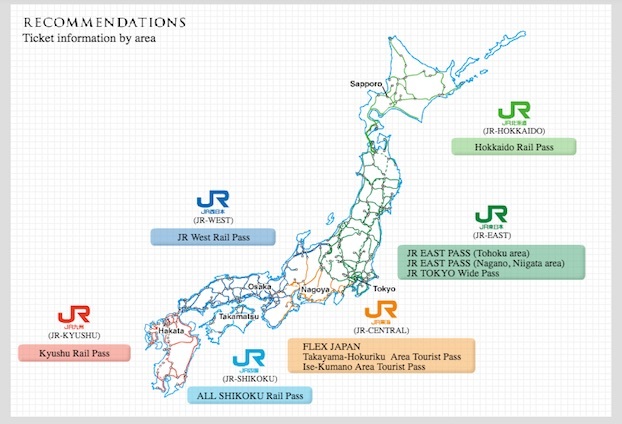 It is especially useful to find out where the JR Pass exchange office is located in stations in Japan. Hanya sah laku selama 3 bulan setelah dibeli. Setelah digunakan kali pertama, ia akan tamat mengikut jenis pass yang anda beli. Sebagai contoh. 7 Days JR Pass. Anda guna mula pada 01 December. dan akan tamat pada 07 dec. So 08 Dec jangan pandai2 guna harap free okayyyy..
Berhati-hati semasa membeli JR Rail Pass. Pastikan semua maklumat betul terutama part NAMA MESTI SAMA DENGAN APA YANG TERTERA DALAM PASSPORT. JIKA ADA BIN/BINTI MESTI JUGA DITULIS SEBAGAI MIDDLE NAME. JR Rail Pass yang salah sebijik pun ejaan tidak akan diterima. No refund juga. Oh okay…. kerana aku sedang berbaik hati dan rajin sedikit, aku tepek lah info tu kat sini. Bagaimana dan di mana boleh beli dan claim JR Rail Pass anda check japanrailpasspurchaseandclaiming kat sini. For more accurate and latest info. Soalan cepumas yang asyik ditanya manusia yang hendak ke Jepun. Berbaloikah beli? Is it worth it? mahal tu…. Pertama sekali, tentulah terpulang bajet anda. Kedua keselesaan. Ketiga MEMANG berbaloi jika anda travel keluar dari Tokyo kerana JR PASS boleh digunakan di seantero Jepun. Jangan lupa download dan print maps about Japan…. Several maps are available on the internet. Here is a useful selection. Ini bukan projek menyusahkan korang sekarang tapi untuk memudahkan anda di Jepun nanti…ada communication barrier..bukan semua boleh ngomong inglis lho! The Japan Rail Pass means you don’t need to buy tickets for every journey (except if you want to book a seat on a Shinkansen). You therefore need to go through the free passage area staffed by the ticket inspector (and not through the gates). It is a good idea to have your passport with you as the ticket inspector may want to check that you are the Rail Pass holder. For the metro (in Tokyo in particular) or on certain private train lines, you must buy your ticket from the automatic machines. The idea is to locate the amount necessary to go to the station that you are interested in, by looking at the large panels generally located to the top of the ticket machines. Then insert this amount in the ticket machine which will print your ticket. Each of these distributors is available in English. To book a seat on board a mainline train (Shinkansen), you need to ask for your ticket numbered in a ‘JR Ticket Office’ identifiable by the green signs. This booked seat is called ‘Shiteiseki’. Of course, you can also take sit where you want: this is the “jiyuseki” system. Finally, since 2007 Japanese trains are all non-smoking, with the exception of some of the mainline trains which are equipped with smoking cars. The same rule applies in the station platforms. The train number and destination are always shown in Japanese and Latin characters. On many platforms, floor markings show where the train doors are located. The trains stop exactly at the door marking location. It is a good idea to queue to access the door as the trains do not stop for long. Additionally, seats are not booked in advance on local trains and the sooner you board, the better your chances of securing a seat. Don’t hesitate to ask a traveller on the platform if the train you are waiting for is going to your destination. Finally, be careful not to take a “Nozomi” train on the Tokyo-Nagoya-Kyoto-Hiroshima line. You must board the “Hikari” or “Kodama” which make a few extra stops. There is a certain discipline involved in waiting for your train on a station platform in Japan: choose a queue (generally indicated by floor markings), and patiently wait behind the other passengers until you can board the car, quietly of course (we are in Japan after all). Silent mode your phone inside the train. Orang Jepun tak bercakap dalam train..sms jerrr. Example: You are departing from Kyoto for Tokyo and want to spend 2 nights in Takayama and Kanazawa. For these 2 nights you can keep a minimum amount in a bag and have your suitcase delivered to your hotel in Tokyo. With the lockers you can stop for 2 or 3 hours in a town, take a tour and then continue your journey on the next train. For example, departing from Kyoto on the Okayama route: you can only visit Himeji (2 ½ to 4 h) if you leave your luggage behind. Most of the major stations have quite large lockers (sometimes in limited numbers however). It is easier to fit in 2 medium-sized bags than a large suitcase. Small stations sometimes do not have lockers for large suitcases: it is better to have soft bags that be easily squashed down than rigid suitcases. There are also traditional lockers with a service ending quite early in the evening. The stations contain specialist stalls selling Ekiben or station bentos, the contents of which are often influenced by the local specialities. There are also many restaurants which are open non-stop and serve many types of food, with something to suit all tastes. Stations often have several exits and are often very large. Don’t hesitate to ask a ticket inspector what exit to take for the place you want to go to. Unlike European trains, Japanese trains do not provide much space for large suitcases. Large cases can generally be stored behind the last seats at the start or end of the car. And your smaller items of luggage can of course be stored above your seat. This will give you untrammelled views of Mount Fuji when travelling to Tokyo from Kyoto, in particular if you are sitting on the left (which corresponds to seats in row E). Cepat! Cepat ! reserved your seat! On local trains and on certain Limited Express trains, the train driver’s cabin is see-through and provides panoramic views of the landscape. This is the place to be. The seats can be turned round by 180°C; as well as enabling you to always be facing forwards, these seats will enable you to travel in a group easily by forming “squares”. Peak times in Japan are between 7 am and 9 am and 5 pm and 7 pm. Most trains are generally overcrowded at those times and make it very difficult to move around with large items of luggage. You will never go hungry on a Japanese train. Major stations offer a wide range of bentos which often contain a local speciality. The use of all trains operated by Japan Railways, that’s more than 20,000 km of railways throughout Japan (except for certain high-speed “Nozomi” Shinkansen trains). This allows you to access the vast majority of tourist attractions from the North to the South of Japan, on the 4 main islands. 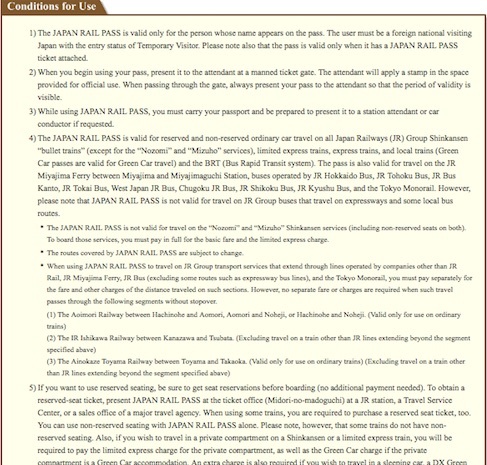 The Japan Rail Pass is refundable, if it has never been exchanged in Japan, for up to a year after the issue date. There is a 10% cancellation fee which will be withheld from your refund. 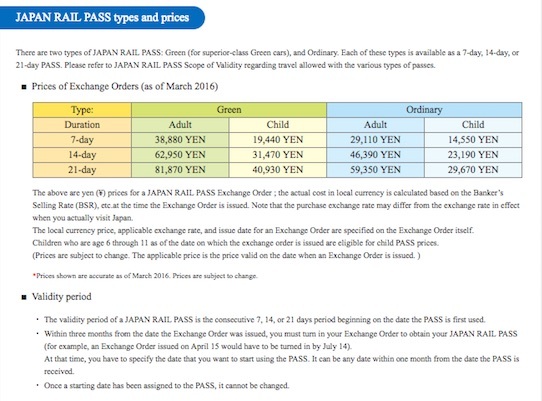 Any Japan Rail Pass ordered by noon is sent the same evening and should arrive the next day by FEDEX (please check out our delivery rates and times on our “Book your JR Pass” page). 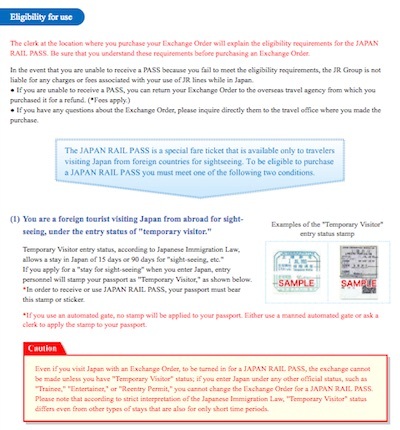 A Japan Rail Pass is created immediately in our office, in less than 15 minutes. No, the national Rail Pass allows everything the Regional Passes permit. A simple arithmetical calculation shows that it is not usually worth adding a regional pass if you have a national pass. 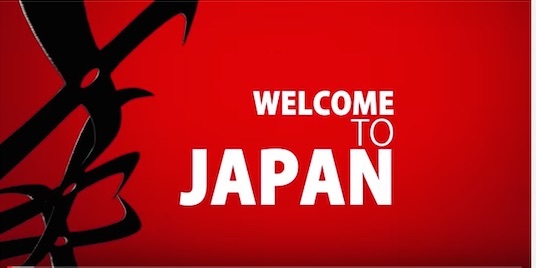 However there are some exceptions, for instance if you visit a specific region of Japan for several days. For example, the “Sanyo Pass” including access to Kansai airport and the cities of Nara and Himeji is recommended if you spend a week in Kyoto, instead of having a Japan Rail Pass. Please feel free to contact our travel agents if you have doubts about which ticket to order. (2) From 27 April to 6 May: during the period called “Golden week” when several public holidays create a super-bridge during which the Japanese enjoy traveling within Japan. (3) Around 15 August during the holidays of “Obon” where the same family group gets together like on New Year’s Day. 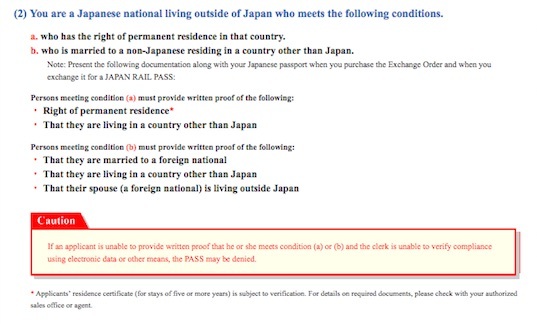 Japanese nationals are permitted to use the Japan Rail Pass and Kyushu Regional Rail Pass under certain strict criteria if they can provide the documents to prove their eligibility when they exchange the voucher for the pass. You can find more information here. Do not go through the gates (because you don’t have a ticket) but show the controller your Japan Rail Pass. Once on the platform, you will easily find the instructions for finding your car. Find out our practical advice on this subject on our “practical tips” page.